Click to listen to episode (2:33). From the Cumberland Gap to the Atlantic Ocean, this is Virginia Water Radio for the week of May 13, 2013. This week, we feature another series of mysterious names. Have a listen for about 30 seconds, and see if you can guess what group of Virginia places includes these names being called out by young Blacksburg residents. And here’s a hint: they’re all public, popular, and particularly natural, scenic, or historic. If you guessed Virginia state parks, you’re right! Colorful and interesting names hint at the varied natural and historic resources—not to mention programs and activities—offered by Virginia’s state-parks system. Since the June 15, 1936, ceremony at Hungry Mother State Park in Smyth County that marked the opening of Virginia’s first six parks, the Commonwealth’s system has grown to 36 parks covering over 60,000 acres, along with several dozen other natural area preserves and historic sites. This system will be on special display on May 18, 2013, when Virginia’s parks will be participating in the third annual National Kids to Parks Day, coordinated by the National Park Trust. Our children and our parks are indeed part of our public trust and our common wealth, so this week or whenever you can, take a kid to a park! 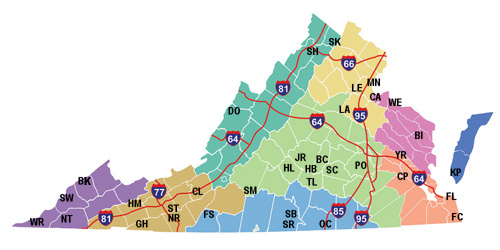 Location of 35 Virginia state parks (not including Tabb Monument, a one-acre property in Amelia County), as of May 2013. The parks, with the map abbreviations shown in parentheses, are as follows: Bear Creek Lake (BC), Belle Isle (BI), Breaks Interstate (BK), Caledon (CA), Chippokes Plantation (CP), Claytor Lake (CL), Douthat (DO), Fairy Stone (FS), False Cape (FC), First Landing (FL), Grayson Highlands (GH), High Bridge Trail (HB), Holliday Lake (HL), Hungry Mother (HM), James River (JR), Kiptopeke (KP), Lake Anna (LA), Leesylvania (LE), Mason Neck (MN), Natural Tunnel (NT), New River Trail (NR), Occoneechee (OC), Pocahontas (PO), Sailor's Creek Battlefield Historic (SC), Shenandoah River Raymond R. "Andy" Guest Jr. (SH), Shot Tower (ST), Sky Meadows (SK), Smith Mountain Lake (SM), Southwest Virginia Museum Historical (HM), Staunton River (SR), Staunton River Battlefield (SB), Tabb Monument (not shown on map; this), Twin Lakes (TL), Westmoreland (WE), Wilderness Road (WR), and York River (YR). Map and list from Virginia Department of Conservation and Recreation We site, http://www.dcr.virginia.gov/state_parks/index.shtml, accessed, 5/13/13. Acknowledgments: Thanks to neighbors in Blacksburg for recording Virginia state park names on May 12, 2013, and for participating in the group recording of “Take a kid to a park!”. Information on “National Kids to Parks Day 2013” was taken from the National Park Trust Web site at http://www.kidstoparks.org/. Information on Kids to Parks Day activities at Virginia state parks was taken from a May 2, 2013, news release from the Virginia Department of Conservation and Recreation (DCR), online at http://www.dcr.virginia.gov/pr_relz_detail.shtml?id=2013-05-02-15-05-24-32239. Other information was taken from the DCR’s “Virginia State Parks” Web sites at http://www.dcr.virginia.gov/state_parks/index.shtml and http://www.dcr.virginia.gov/state_parks/his_parx.shtml.